You are out with your pup on a daily walk when something catches your her eye. Before you can react you feel the leash go taut. You expect to see her rear up when she reaches the end, but you watch, horrified, as a tear starts to form and, in an instant, SNAP. The reverberation of the leash busting hits you like an earthquake. Everything is happening at lightning speed but it seems like you are watching it in slow motion, unable to move or react. Your heart is pounding in your ears, you can barely make sense of the scene that is playing out before you. Your best friend, your confidant, your partner in crime, is barrelling full speed away from you in pursuit of a squirrel. You scream louder than you ever thought you possibly could. Your worst fears have come to fruition, she ignored her recall, she is gone, what are you going to do? Who can you call? The cellphone screen is barely legible through the panic and the tears. You didn’t even realize you were crying. You start scrolling past your welcome screen when something catches your eye. It’s the Whistle app! In the cacophony of emotions going through your body, you had completely forgotten your baby girl has a GPS clip on her collar. The app can’t open fast enough…as soon as you find her GPS signal, you are off like a bolt of greased lightning, seemingly closing a distance of a few hundred yards in mere moments. You find your girl with what is left of her leash wrapped around an old log. She is terrified, trapped, and trembling. After showering her love and “don’t ever do that to me agains” your mind starts to play the scenario minus the GPS clip until the thoughts become too much to bear and you push them from your mind. This nightmarish scenario actually played out for Nat and Kim Braum. Their beloved Irish setter “Charlie” got away from them at a park while out for his daily walk. Fortunately for the Braum’s they had recently outfitted charlie with a GPS tracking device allowing them to find Charlie within a few miles of where he was lost, scared and trapped. They saved their boy and within a few days he was no worse for the wear. When I read this story it reminded me of a scare we experienced with my Sully boy when he was just a few months old. Ironically, we had gone to Petsmart to get him some odds and ends, but we also needed to go to the Target next door, so we decided not to bring him on the trip. Back then we didn’t know that our side gate was not dog proof. We quickly became aware of this problem when we arrived home and he was nowhere to be found. I was in such a panic, I walked around the neighborhood for an hour yelling my face off. Every time I heard the faintest sound in the woods I thought, seriously, about braving the swamps and going in there after my boy(we live in Florida, so such an endeavor is wrought with danger). Fortunately, as I was about to make that plunge, I got a phone call from K2 informing me that our boy was at the neighbor’s house! What a relief! I think the moral of both stories is the same. Accidents and the unexpected occur frequently. 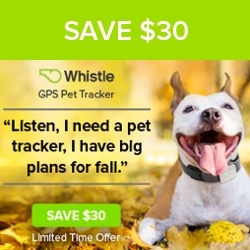 A simple device like a Whistle is a must haves for dog owners! If you are interested in learning more about how the GPS tracker works you can visit the FAQ here.